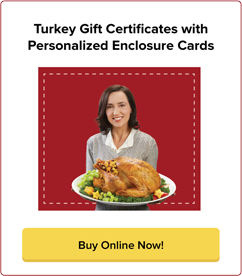 Turkey Or Ham Gift Certificates | Employee Gifts | gThankYou! Delight recipients with the choice of turkey or ham for the centerpiece of their holiday meal with gThankYou! Turkey Or Ham Gift Certificates. A meaningful, yet affordable employee holiday gift that your enitre workplace will appreciate and enjoy sharing with family and friends. Your company or organization name printed on Certificates. Free! What are gThankYou! Turkey Or Ham Gift Certificates? gThankYou! Turkey or Ham Gift Certificates are Manufacturer Coupons good for any brand of whole turkey or a half or whole ham. They can be redeemed nationally in all chain grocery stores that accept Manufacturer Coupons. Recipients shop at the store of their choice and select the size, brand and preparation of turkey or ham they want for the centerpiece of their holiday meal. Watch the video at right to see our founder Rick Kiley explain how gThankYou Gift Certificates work and why they are America’s Favorite Employee Gift Certificate™! Where can recipients redeem their Certificates? Recipients redeem their Turkey Or Ham Certificate at any grocery store chain in the United States that honors Manufacturer Coupons. The only stores that do not accept gThankYou Gift Certificates are stores that do not accept any Manufacturer Coupons, such as Sam’s Club, Costco, specialty stores such as HoneyBaked Ham, and the Aldi chain. Download our one-page guide "About Your gThankYou Gift Certificate" to share with recipients or print off and post in your company break rooms. It’s available in English and Spanish. Do you offer discounts for large volume purchases? Yes! Call us at 888-484-1658 to learn more about Turkey Or Ham gift voucher volume pricing options. If you have a large distributed workforce we can assist with custom online ordering, distribution, fulfillment and more. Call us today to learn more! You can receive your order as soon as tomorrow! Ordering is easy – online or over the phone at 888-484-1658. Virtually all holiday gift orders ship the day they come in. gThankYou ships via UPS and can expedite any order to meet your timing deadline. We’re also happy to schedule delivery in advance to meet your needs. What does a gThankYou! Turkey Or Ham Gift Certificate look like? Can I personalize my Gift Certificates? Absolutely! All gThankYou Gift Certificates can be personalized with recipient and giver names. Best of all, personalization is always free. Enter recipient names online when ordering, or email an Excel spreadsheet with names (first name, last name) along with your company name and order number to [email protected]. I love the FREE Enclosure Cards to go with my employee holiday gift! How do I order them? When you order online, we’ll ask you if you would like the free cards. Click YES! Once your order is complete, an email is sent to you with an ordering link for your free cards. We offer card designs for all occasions, each printed on high-quality cardstock that is three inches high by four inches wide (3” x 4”). Click the online ordering link and give us your design choice, personal message and upload your company logo if you would like it included on your cards. We create and send you a proof of your card design. Once you approve it, we’ll send your free Enclosure Cards along with your order. Your thoughtful gift isn’t complete without your FREE gThankYou Enclosure Cards! It’s the perfect opportunity to share your heartfelt appreciation at holiday-time or anytime. Why do companies choose gThankYou Gift Certificates vs. Gift Checks or Gift Cards? Companies choose gThankYou Gift Certificates because they are Manufacturer Coupons and are only redeemable for the item specified. They have expiration dates, have no cash value and no change is given. For example, a Turkey Gift Certificate is only redeemable for a whole turkey – any brand, at any grocery chain store in the United States. 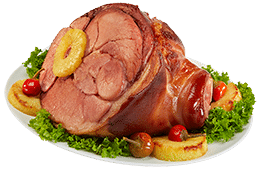 A Turkey Or Ham Gift Certificate is only redeemable for a whole turkey OR a half or whole ham. Gift Checks such as Butterball® are like cash and can be put in a checking account or used to purchase any merchandise. Gift Cards are store specific and again, good for any store merchandise. If you are concerned with the tax implication of employee gift-giving, please consult with your accounting or tax professional. The perfect employee appreciation gift for any holiday – Thanksgiving, Christmas, Easter and more! That’s because the thoughtful gift of a turkey or ham is versatile – and appreciated anytime and for any holiday! Everyone loves receiving a holiday gift they can share and enjoy with family and friends. gThankYou holiday food gifts can be used anytime from Thanksgiving all the way through Easter! We believe in giving recipients plenty of time to redeem and enjoy their gift, whenever is best for them. The gift of a turkey or ham is appreciated year-round. Looking for a way to thank your staff during the summer months? A grilled turkey or ham is a crowd-pleasing centerpiece to a summertime meal. Appreciation energizes workplace culture and is essential to employee motivation, productivity and loyalty in today’s workplace. Show your appreciation today with an affordable gift and message of gratitude that your employees will remember. We offer more than Turkey Or Ham Gift Certificates! Choose from a variety of our popular food Gift Certificates perfect for workplace holiday gifts, anytime appreciation, wellness incentives and customer promotions. You select the variety and value that best fits your objectives and budget!